Last week, in Part One of the Wildnerness Lodge Saga, I talked a little about the magnificent lobby at the Wilderness Lodge. Wilson & Associates (who later designed the interiors for Disneyland Paris Cheyenne Hotel) under the design team of Connie Jackson and Susan Seifert were responsible for the interior of the Wilderness Lodge. As reference, they used the books Great Lodges of the National Parks by Christine Barnes and True West by Christine Mather. The lobby is a tribute to Native Americans. Whispering Canyon Cafe showcases cowboys as depicted on the backs of the chairs and the fireplace. Territory Lounge is the home to the explorers including a vintage U.S. flag from the 1800s. Artist's Point celebrates the painters who captured the images of the wilderness with murals inspired by Albert Bierstadt, who is known for his lavish, sweeping landscapes of the American West. Throughout the resort, the furniture and lighting fixtures were inspired by American furniture designer Thomas Molesworth, who had an understanding of Native American culture and the American West. This influence is notable in the flat backed chairs in Whispering Canyon Cafe. Other pieces in Disney's Wilderness Lodge were inspired by Charles and Henry Greene, who ushered in the American Arts and Crafts Movement that is seen throughout the entire resort. Since the furniture was inspired by deceased artists, Wilson & Associates had to custom design every single piece. To the right of the lobby side of the fireplace is the elevated Library area of Whispering Canyon restaurant. It has both Gustav Stickley chairs and Frank Lloyd Wright tables and china cabinet. Stickley was a proponent of the Arts and Crafts Movement, traditional craftsmanship in simple forms. The pottery and ceramics that adorn the cabinet are authentic Arts and Crafts pieces from the Arts and Crafts Movement. They are a 100 years old. Mass production by machines was becoming more common so the Arts and Crafts Movement emphasized the appreciation for hand made glass and pottery because they expressed the unique individuality of the particular artist. It is a wonderful sensory experience to seemingly leave Florida property when you turn off World Drive onto Timberline Drive, into a world of wildflowers, pine forests and bears of the Pacific Northwest. The lodge was supposedly built around a hot mineral spring that becomes Silver Creek and flows toward Bay Lake, stopping briefly to ignite Fire Rock Geyser. However, generally unknown to guests and cast members, there was a fairly detailed backstory created by the Imagineers about the Lodge when the resort first opened on May 28, 1994. According to articles in a commemorative edition newspaper titled The Silver Creek Star Vol. B, No. 28,928 (actually a clever way of communicating information to guests staying at the Lodge about the guest services procedures, as well as sharing the colorful Imagineering back story), Wilderness Lodge had a rich history and it centered on the exploits of one man: Colonel Ezekiel Moreland. A magnificently beautiful valley in America's Northwest was discovered by Colonel Moreland in the early 1800s. He described the location in a letter to his daughter as "a tranquil valley along the shores of a splendid lake…a cathedral of trees that touch the sky, a stream that glitters with radiant light, rocks and minerals of every color and description…I call this sweet valley—Silver Creek Springs." Later, he returned to settle this frontier area and make it his new home along with his daughter who was a young art curator nicknamed "Jenny". The Carolwood Pacific Room opened in 2007 at what is now the DVC Boulder Creek Villas. It was previously called the Iron Spike Room. According to the Silver Star: "Using the small fortune Moreland had raised from the fur trade, they brought out a crew of men from St. Louis and had a small lodge built near the fresh water spring. The Wilderness Lodge welcomed artists, scientists, and nature lovers of all kinds over the years. As the number of visitors grew, the Lodge expanded to accommodate them. Eventually, they added rooms that grew around the spring, making it part of the Wilderness Lodge." Artist Point became a location where guests could experience the grandeur of the vistas that inspired the painters whose work decorated the dining room. In the beginning, every location at the Wilderness Lodge had a back story, as well. The Teton Boat and Bike Rental building, located near the lake shore, was supposedly the original cabin that Colonel Ezekiel Moreland built shortly after arriving in the valley for the first time. The Colonel learned the legend of the Fire Rock Geyser from the Indian elder known as Running Elk. During one especially bad winter, an Indian hunting party had been trapped in the valley by excessive snow. They built a fire and were forced to keep it burning continuously. After five days, the rock beneath them began to crack and tremble. The next day, the trembling became even greater and as they placed another piece of wood on the fire, the Earth opened up and a great pillar of hot, steaming water erupted upwards, launching a nearby teepee high into the air. The frightened group fled the valley with warnings to avoid the location where they had angered the earth with their wasteful use of continuous fire. Georgie MacGregor, an unlucky prospector, brought dynamite to aid in his mining of the area, but ended up blowing up his cabin and the huge crater that remained became the pool. The name of the area obviously brings to mind the very famous Silver Springs in Marion County, Florida, home to one of the largest artisan springs in the world and forming the headwaters of the Silver River. The location is a famous tourist attraction (with glass bottom boat rides) and has been used as the site for filming many movies, including some scenes for the classic Tarzan flicks. The vivid adventures of Colonel Moreland and his friends, just like those of Merriweather Adam Pleasure for Pleasure Island, have completely disappeared from Disney history along with so many other interesting tales that should be recorded for future researchers. William Robertson was a Disney character sculptor before becoming self-employed. Disney hired him to build frames for topiaries, which he did in the backyard of his College Park home. One of those topiaries was the 14-foot long bison out in front of the entrance of the Wilderness Lodge that included its embedded footprints in the walkway leading to his final location. Robertson was also responsible for the topiaries in the Johnny Depp film, Edward Scissorhands (1990). Displayed in the lodge posts of the Wilderness Lodge lobby are many carvings by Robertson, showing along their height the four corresponding levels of animal life living in the wilderness. At the lowest level, you find the creatures of the field and meadows, such as the turkey, raccoon, squirrel and rabbit. The animals on the next are those on the lower mountain, such as the wolf, pronghorn antelope, bison and elk. On the third are those of the high mountain level such as the mountain goat, sheep, bear and mountain lion. The highest level has the birds of prey such as the falcon, American bald eagle, hawk and owl. It took four tons of wood to create these creatures. On average, it was 10 days to carve each animal using an electric saw, rotary saw, a chisel and a hammer. Robertson did massive research and then rendered drawings that he used to create scale clay or plaster models as guides. Mountain goats and some Rocky Mountain sheep look similar, so Robertson had to emphasize the subtle differences in head shapes. Disney suggested some animals they would like included but the artist said that after that point he had a free hand. "I had to know how to fit the animals into the trees," Robertson said. "Each animal had to be carved around the limbs, knots and rotten spots. There was no way to change the tree." Robertson said he wanted to "show the mark of the hands of the artist—not slick but a rough, human feeling". "Disney will try and do something artificially to meet fire codes or to get it to be weather-resistant," Robertson said. "But in this instance everything was done in the traditional way, by the artist, by hand." Every night during the six months before the hotel's Memorial Day 1994 opening, Robertson climbed scaffolds to chisel into the pine logs. "We finished the day before the hotel opened," he laughed. Robertson's sculpture work can also be seen on the six brass animals at the check-in desk that were purposely positioned at a children's level so they could be petted by curious youngsters. The beavers in the elevator holding a long stick that is used as a railing are also the work of the sculptor, who at one time worked with Disney Legend Blaine Gibson, renowned for his Disney sculpting. As a bit of whimsy, Robertson also took months to carve the cedar character totem pole outside the Mercantile gift shop that features Mickey Mouse, Goofy, Donald Duck, and Humphrey the Bear. Over the years, the store has sold exclusive merchandise featuring the image of Humphrey. "This wasn't necessarily just another traditional Disney image," he said. "That was rather exciting as an artist. I had freedom to have a little fun. I called an artist in Oregon to get advice on how to handle that kind of wood. I'd never have chosen cedar. It has to be kept sopping wet to cut it. But the other totem poles were also done in cedar." Disney's Wilderness Lodge Resort is the only Disney resort hotel to have an official mascot, the brown bear. Images and allusions can be found throughout the resort, including bear tracks embedded in the walkways. To make that potentially fearsome mascot friendlier for younger guests, some of the brown bear images are of the Disney animated character Humphrey the Bear, a lovable, overweight brown bear who lives in the fictional Brownstone National Park which also themes into the idea of a National Park lodge. In addition to the Mercantile totem pole, Humphrey pops up on signage throughout the resort that many guests fail to notice. On the road leading to the Wilderness Lodge, just to right before the archway, is a round metal sign with silhouettes of Mickey Mouse being followed by Humphrey. At the entrance to the Boulder Ridge Villas is another metal sign with the silhouettes of Mickey walking along and Humphrey riding on top of an old-fashioned penny farthing bicycle to mark the bike path crossing. Only seven Disney cartoon characters have starred in their own theatrical cartoon series. Humphrey the Bear was the last one to do so, starting in 1956, before the Disney Company decided to stop making theatrical cartoon shorts. According to the Imagineering backstory, on the land adjacent to where the Wilderness Lodge would later be built, a team of railroad workers in the 1860s found an ideal location to set up camp as they built the transcontinental railway. They built themselves a place to stay but moved on once their job was completed. The Urban Design Group was responsible for the design of what is now known as the Boulder Ridge Villas. The biggest design challenge for UDG was to build a larger building with slightly different requirements on a constrained site comprising two acres of wetlands and adjacent to a dominant and beloved iconographic building, but with a smaller budget and shorter construction schedule. In addition they had to create the illusion that the 147 room DVC property was constructed prior to the Wilderness Lodge, even though in reality they were opening almost a decade later. So, among other things, a different color palette for the roof and shingles was utilized. The inspiration for the villas came from the early railroad hotels developed by Fred Harvey in the early 1900s. Randy Johnson of UDG stated, "The DVC's clapboard and shingle structure reflects the simple and straightforward approach of early railroad hotel architecture and gives the building the appearance of having been built prior to the Wilderness Lodge." The four-story octagonal-shaped atrium, complete with log columns and central stone fireplace forms the central lobby and is reminiscent of a railroad roundhouse and serves as a transitional area to different locations. At the second floor lobby balcony frieze, ornamental stenciled graphics and carved log beam ends depicting animals celebrate the Native American medicine wheel and the Circle of Life. Sculptor William Robertson also came out of retirement to carve the animals on those logs. He even included a hidden three-dimensional mouse in one of the log beams. When this DVC resort opened, it featured a small, quiet room off to the right side of the lobby called The Iron Spike Room. An iron spike was traditionally used on railroad ties. In the fall of 2007, it was renamed The Carolwood Pacific Room thanks to the efforts of Michael Broggie, co-founder of the Carolwood Historical Society and son of legendary Imagineer Roger Broggie. "The Iron Spike room name fit the railroad theme, but I wanted to see the name truly represent the backyard railroad that played such an important role in Disney history," Broggie said. From 1950-1953, Walt Disney transported friends and family through his elaborately landscaped backyard in Holmby Hills, California, on a 1/8th scale train dubbed the Carolwood Pacific Railroad. It was named for the street where Walt lived at the time (355 North Carolwood Drive) as well as to reference the Central Pacific Railroad from the turn of the century. Walt called the engine, based on a Central Pacific 1872 locomotive, the Lilly Belle. 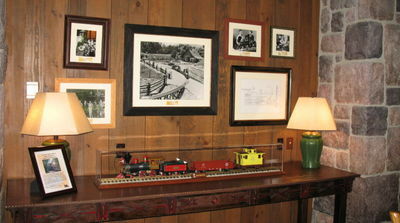 From the beginning, the room was decorated with train memorabilia and framed photos related to Walt Disney's love of trains. Broggie helped the Imagineers locate the authentic artifacts that filled the room. A cattle car, a gondola car (both hand built by Walt and Roger Broggie) and a stretch of track all from the actual backyard railroad was donated to the area by Walt's oldest daughter, Diane Disney Miller and her Disney Family Foundation. The cars feature the Carolwood Pacific "Fair Weather Route" logo. The rest of Walt's miniature railroad is displayed at the Walt Disney Family Museum in San Francisco. Another car from the train is displayed at the Disney Barn at Griffith Park in Los Angeles, California. A painting on display is "Walt's Magical Barn," by artist Bob Byerley created in 2001 in celebration of Walt Disney's 100th birthday and used as the cover for a book published by the Carolwood Pacific Society. Also on display in a Lucite case is a special limited edition re-creation of the CP 173 Lilly Belle locomotive engine, tender, gondola car and the yellow caboose from Walt's Carolwood Pacific Railroad. It is beautifully detailed with Gold Leaf Filigree, a Brass Bell, Whistle & Accents; Faux Wood Finish on the Cab. It was produced in 2000 in garden gauge (1:24 scale) by Hartland Locomotive Works of Indiana. This Limited Edition (1500 Units) was only offered through Disneyland, Walt Disney World (five locations), Disney Direct catalog and Disney Galleries. It originally sold for $595 and came with a solid oak base and an authentic piece of rail from Walt's backyard railroad. The room remains a hidden treasure today. "We were pulling from different materials and objects that were indigenous to the Pacific Northwest. What we wanted to do, knowing that this resort would have been here for hundreds of years, is take materials that these settlers would have found on site and the rejuvenation and sort of re-gentrification of the area. "Its found objects that would have almost been artifacts from the mining area from the railroad are incorporated. They would have been repurposed and built into their everyday houses and everyday construction. "Everything was coming westward on the trains and this is really an homage to Walt (Disney) and his love of trains and the westward expansion of the United States. So we played on that to make everyone feel that this was an early settlement. Everything is rooted in the history of railroad and the natural environment. We wanted to make it feel like the interior expanded into the exterior so there's floor-to-ceiling windows." Ken Potrock, senior vice president and general manager of the Disney Vacation Club said, "Our guests have told us they don't want any old hotel; they want themed hotels. They want a hotel that has a backstory. They want to hear 'is there a connection to Walt Disney?' So we worked hard to give them what they wanted." Copper Creek that continues the storytelling of Disney's Wilderness Lodge, is inspired by the "legendary mining and railroad history of the Pacific Northwest," as well as Walt Disney's love of railroads. Where the tale of the original structures at Wilderness Lodge draw their story from the 1800s, the new Copper Creek Villas & Cabins are tied to a later period when the railroad, mining, and quarry managers and foremen brought their families out west and built homes (like the cabins) along the lakes with some of the materials and objects found in the area. The story concept is that the units employ "up-cycling" of materials like rustic tracks and reclaimed wood, as well as giant cogs that form a wall hanging and an occasional Hidden Mickey. Light fixtures are made from shards of colored glass from the quarry and, above the dining table, a chandelier featuring a giant cog from a crane. Artwork in the rooms (like photographs from Vancouver), plus exposed steel beams and lots of wood are all used to reinforce the story. However there are also playful references to the Disney characters Ruke and Tuke from Brother Bear (2003) and Chip'n'Dale. The villas and cabins also have imitation wood flooring that according to Miorelli was "hand-scraped to make it feel like it came out of a sawmill." "A sweeping re-imagination of the former Hidden Springs Pool area will help tell the richly layered back story of Boulder Ridge in what appears to have been an abandoned rock quarry. "Such rejuvenating transformations were common in the Pacific Northwest following the mid-20th-century fading of the Transcontinental Railroad, as locals turned rails into trails – repurposing everything from bridges and tunnels to cranes and quarries. "A nearby Boulder Ridge Railway and Mining Co. water tower will be among the pool area's landmark reminders of its pioneering past while a vintage mine cart supports the mining theme with an affectionate nod to Disney history." Nearby is a crane recycled from Disney Hollywood Studios now closed Catastrophe Canyon. The Wilderness Lodge is a perfect example of how coming to Walt Disney World is not just a physical experience, but an emotional one, too, thanks to the subtle theming and attention to detail that most guests never consciously realize.